Red Cross volunteers (L-R) Chris N., Sharon K., and Friday pose for a photo just after a Disaster Action Team call. The Red Cross responds to approximately 64,000 disasters in the United States every year, ranging from home fires to earthquakes. In these events, the Red Cross provides shelter, food, health and mental health services to help families and entire communities get back on their feet. It is amazing to think that 95% of disaster relief workers are volunteers! 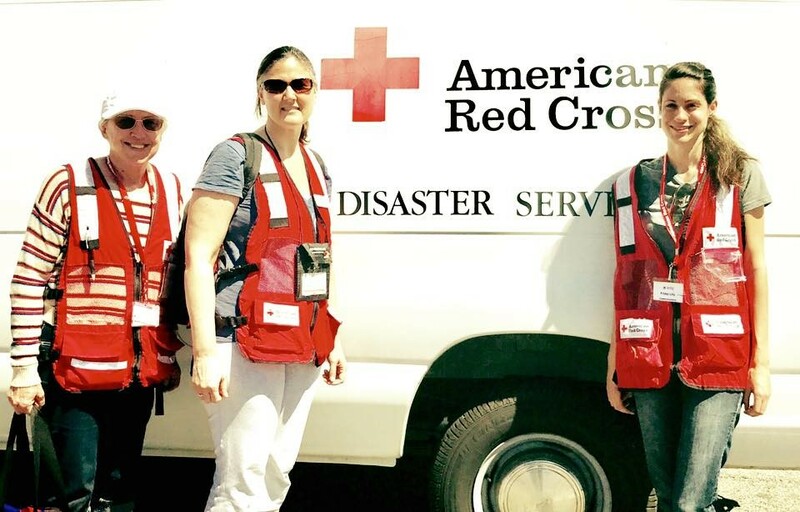 Many people do not know what a typical Red Cross volunteer does, so this article provides a first-hand perspective on what to expect your first day out as a Crisis Response Volunteer for Orange County. After getting the phone call and responding, I drove to the address provided by the Red Cross. The scene was ominous – a crumpled semi-truck was unnaturally sticking halfway out of an apartment building. It was as if it had wings and flown across the busy street defying gravity into the structure. There was a crowd of neighbors awestruck watching from the taped-off sidewalks while firefighters and police officers assessed the scene. I took a timid step toward the damage; this was my first response on behalf of the Red Cross. While I had ample training, I was still naturally nervous that I did not know enough to provide adequate services to the victims. However, almost as soon as I arrived, a sweet voice called to me and beckoned me to join her. Two other Red Cross volunteers were standing with police officers and fire fighters. Immediately, I felt relief that my captain was there, along with another experienced responder. They soon took me under their wing. I shadowed them as they made their way across to the family. The family only spoke Spanish, but luckily, one of the young adults was able to translate our responses in English. We began by assessing the damage with a form and collected basic information from the victims. We let them talk of their worries and their struggles and about having to find a new home. It felt like I was in the right place at the right time – supporting victims when they were still in total shock over the situation. We were not only able to provide money for housing and for food, but we were even able to give clothing to one of the children who only had one shoe on. The family could not go into their apartments because the fire department was worried the building would collapse on them. Red Cross volunteers were able to give each of the victims water, snacks, and a little care package. We helped call their home insurance companies, looked up nearby hotels, and provided other house and medical assessments. However, the part that I felt as volunteers that we were the most valuable, was to be a listening ear for the victims in their time of grief and struggle. Even though we did not speak the same language, we were still that shoulder they could lean on – not only for guidance, but also for love and support. There is no better feeling than volunteering your time to a family in need. I always remind myself that this type of disaster could happen my own family, so it is a very necessary and rewarding experience to help a neighbor in their time of need. If you would like more information on becoming a Red Cross volunteer, please go to redcross.org/volunteer.